This chart focuses new hire salaries for political science faculty at four-year institutions in the United States. 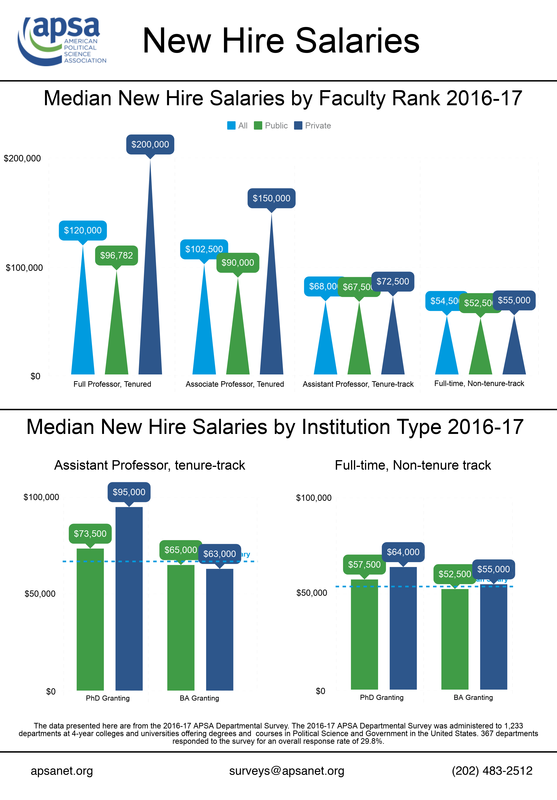 The chart highlights median new hire salaries in 2016-17 by faculty rank, institution type, and highest degree offered. Overall, private institutions offer higher new hire salaries across all faculty ranks. Despite having higher overall new hire salaries, Assistant Professor, Tenure-track faculty experience greater disparities between new hire salaries at PhD-granting and BA-granting institutions than do Full-time, Non-tenure-track faculty. For more information on faculty salaries, see the 2016-2017 Salaries Report. To review other reports on the APSA Departmental Survey, as well as to read reports from previous years and on other surveys, please click here.